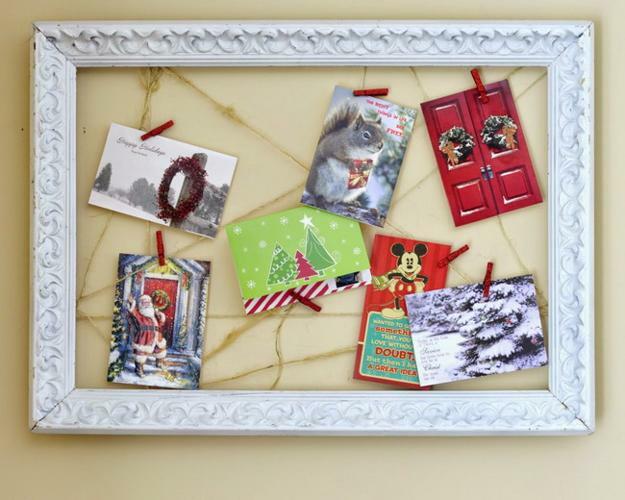 Here are DIY winter holiday decorations created with old Christmas cards. 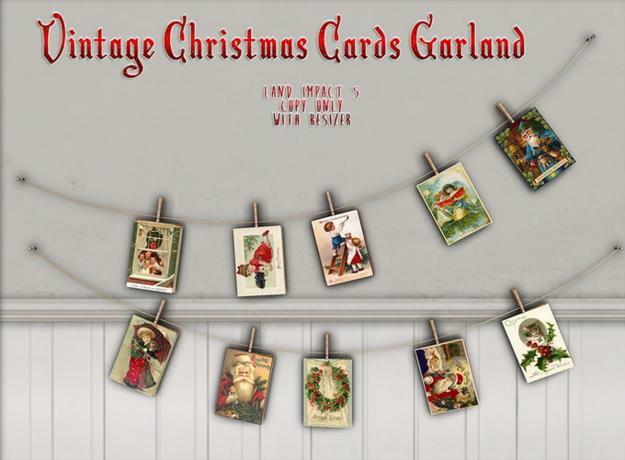 Check out the card display ideas to find the best ways to showcase your vintage cards and make colorful and cheap decorations for your empty walls. 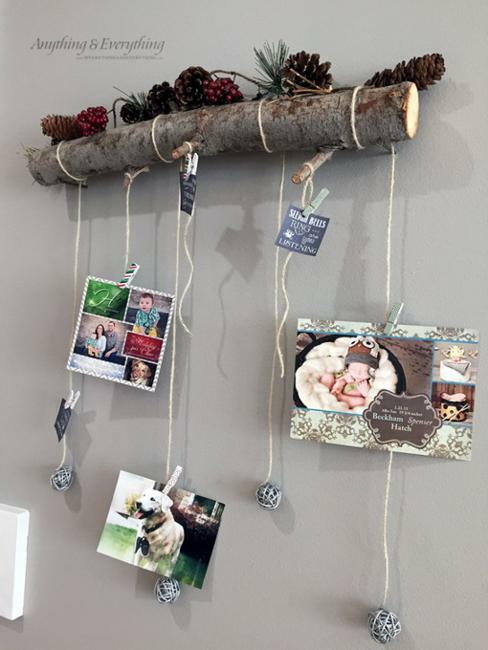 If you know what to do with your holiday cards, still look at creative wall decorating ideas that can inspire you to try new display ideas. 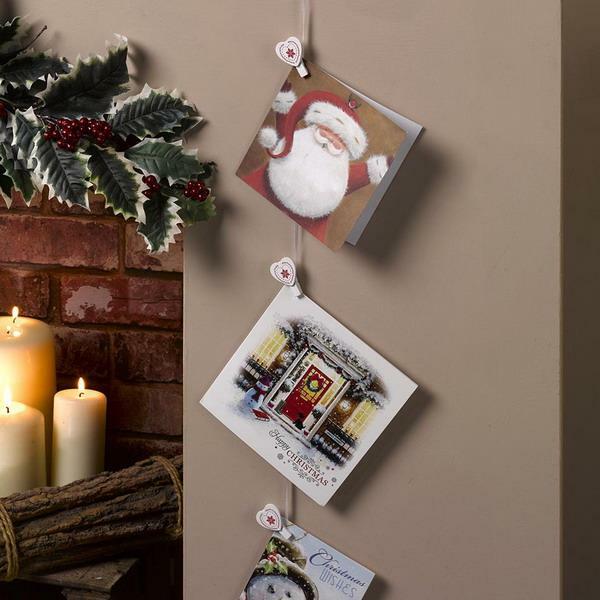 Wall decorating with Christmas cards is easy and quick. 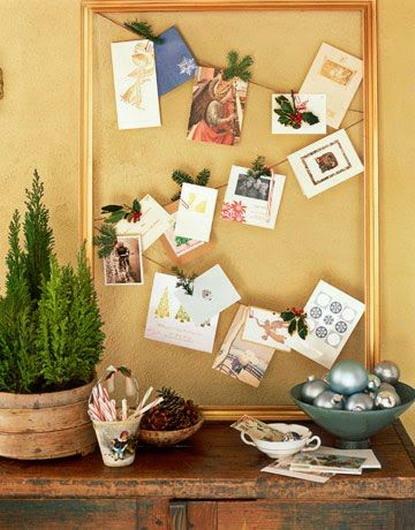 Your piles of cards will disappear in no time turning into festive, colorful, creative wall decorations that spice up the winter holidays. 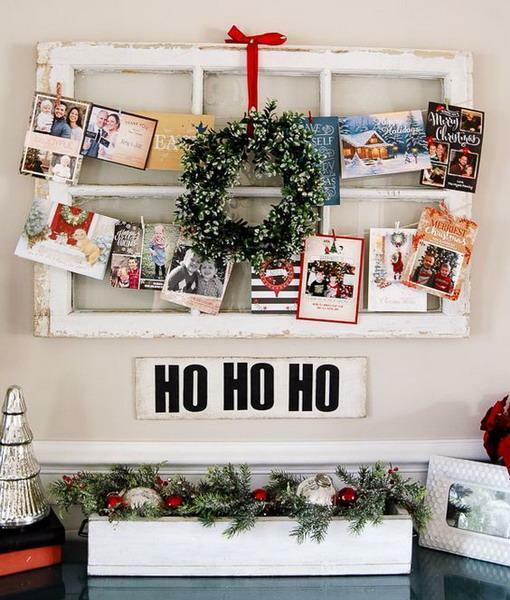 The best Christmas card display ideas include attractive hangers, wall-mounted holders, DIY ribbon and fabric organizers, and many other designs. 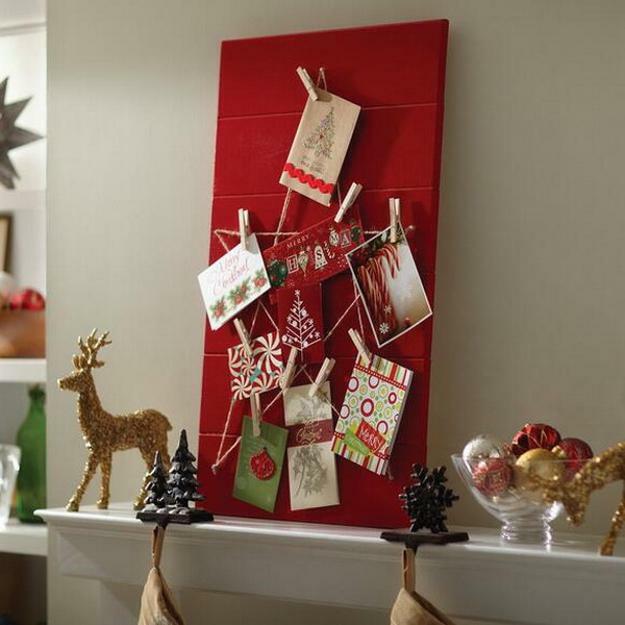 Look at the collection of wall decorating ideas and find your favorite way to display Christmas cards for the holiday season. 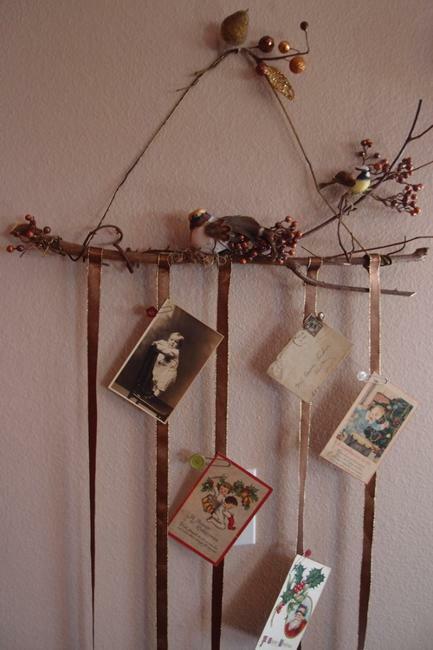 You can use DIY wall-mounted holders to display vintage cards or hang them on a wire and frame them. 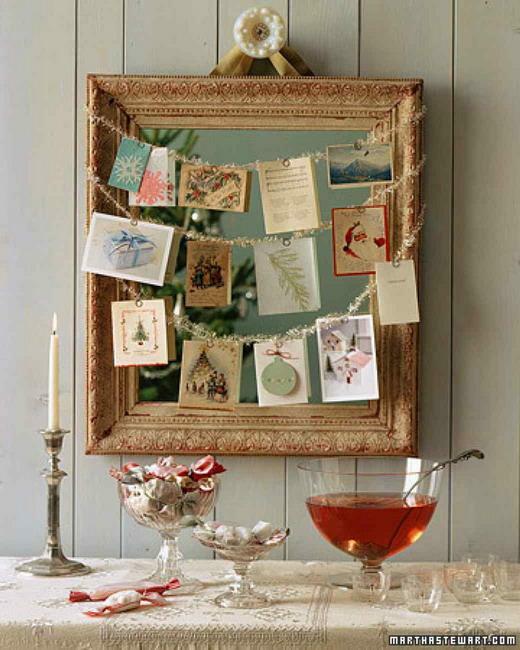 You can clip or pin vintage Christmas cards to string lights or decorate Christmas garlands with them. 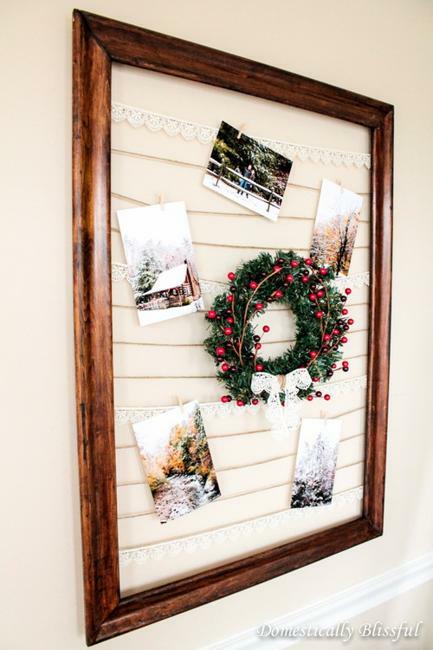 There are numerous attractive and creative ways to adorn your empty walls while recycling old holiday cards. 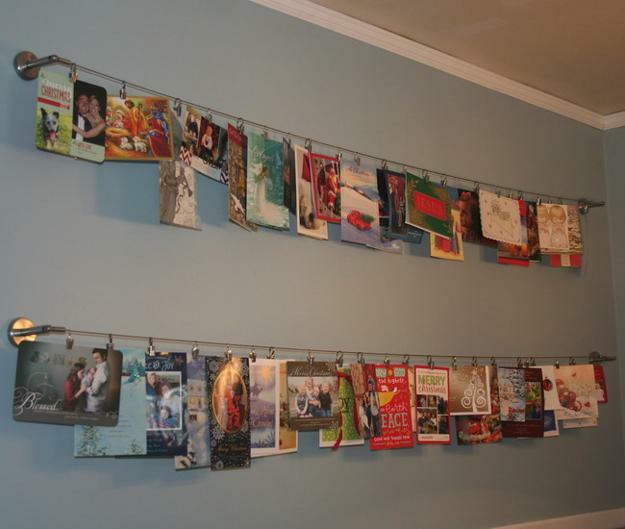 An ornamental chain can turn into a wall Christmas tree with cards as ornaments. 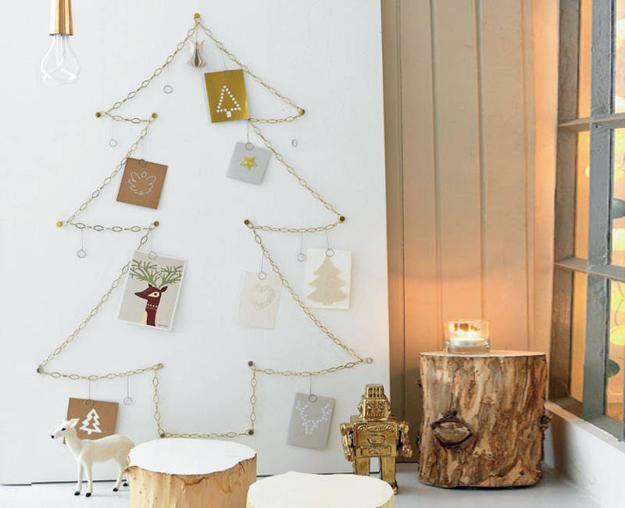 A large chain beautifies the wall Christmas tree design and adds a festive holiday vibe to room decorating. 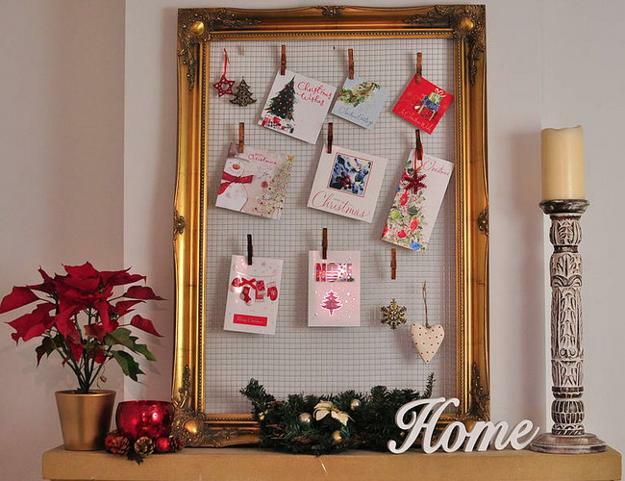 Chicken wire is another great idea for displaying cards and wall decorating for the winter holidays. Recycling an old window for a rustic wood frame creates an excellent wall decoration. 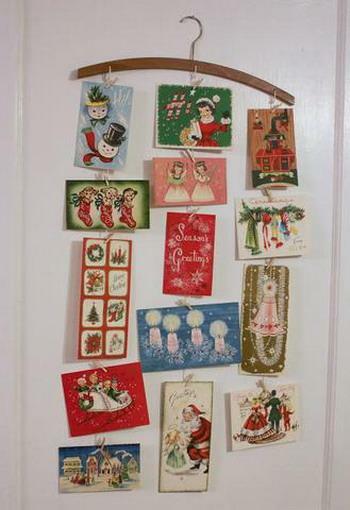 Hanging colorful ribbons with vintage cards give a vibrant feel to wall decorating. 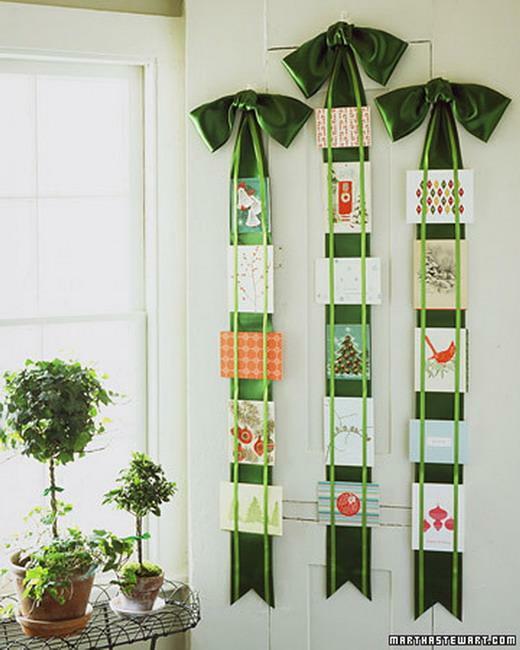 Pin your Christmas cards and display them on large, decorative fabrics. You can use the technique for your window and door decoration also. 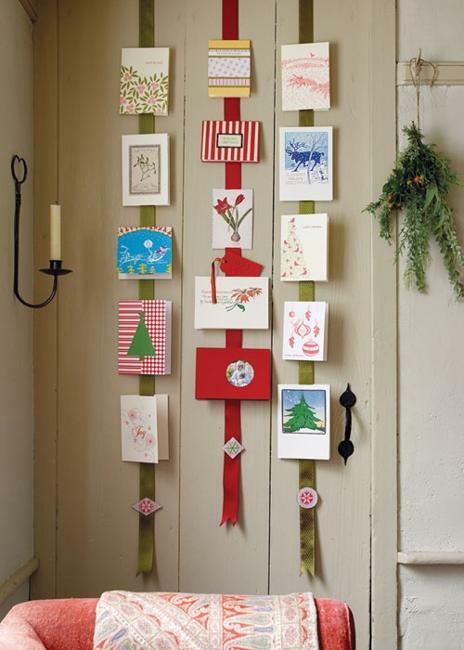 You can design a wall Christmas tree with your cards. A pyramid shape looks colorful and festive, just like a real holiday tree. Don’t forget to top the tree with a star to increase the effect of creative Christmas decorating. You can display cards artfully in wooden boxes and add a unique touch to wall decorating. 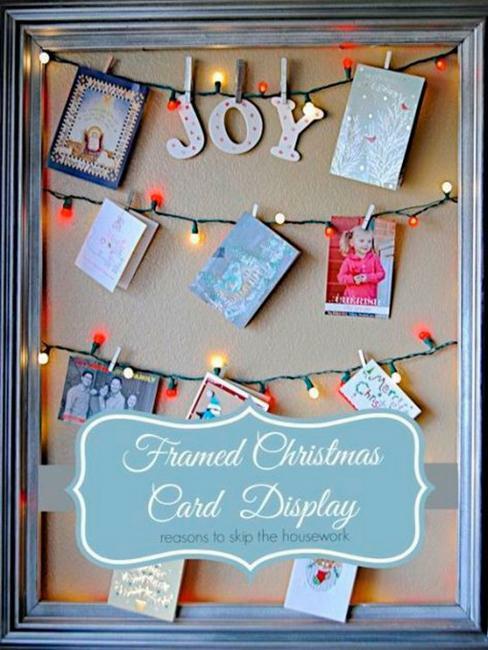 Add string lights and decorations to your creative cards display and enhance the winter holiday feel. 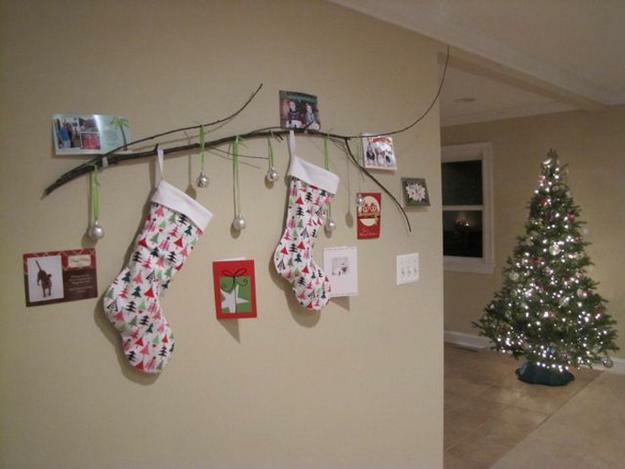 Use logs, old hangers, winter branches for creating eye-catching wall decorations. 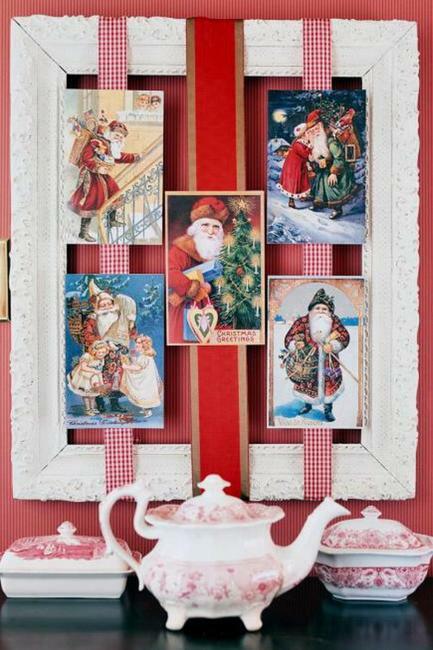 Recycling is the ideal way to accentuate festive holiday walls and add a touch of vintage style to Christmas decorating. Every card can be recycled for crafts and wall decorations. 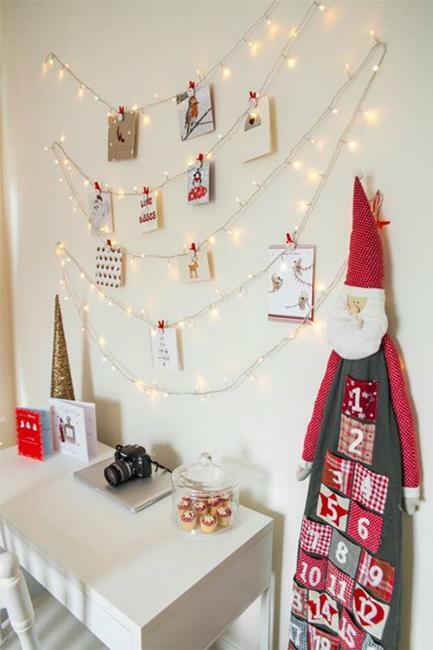 All your empty walls can look beautiful and bright when you turn them into smart displays for colorful Christmas cards. 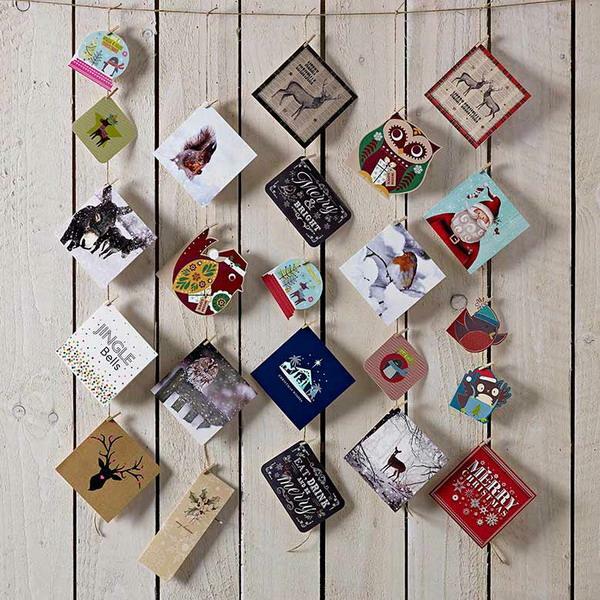 For a whimsical look, create original hanging designs, use winter branches or logs, and add colorful Christmas tree decorations and string lights to your cards.